That’s good news for nail techs! Below, we’ll give you five recommended treatments to help heal your clients’ heels. Each of the suggestions functions as an add-on to a regular pedicure service, so be sure to schedule appropriately and inform the client you’re providing a heel-focused step within the service so she understands the difference in the price. Market these heel services intentionally: Promote them on Facebook, put signs around the salon, and pass out promo cards. Heel care is a great hook to attract both male and female clients. 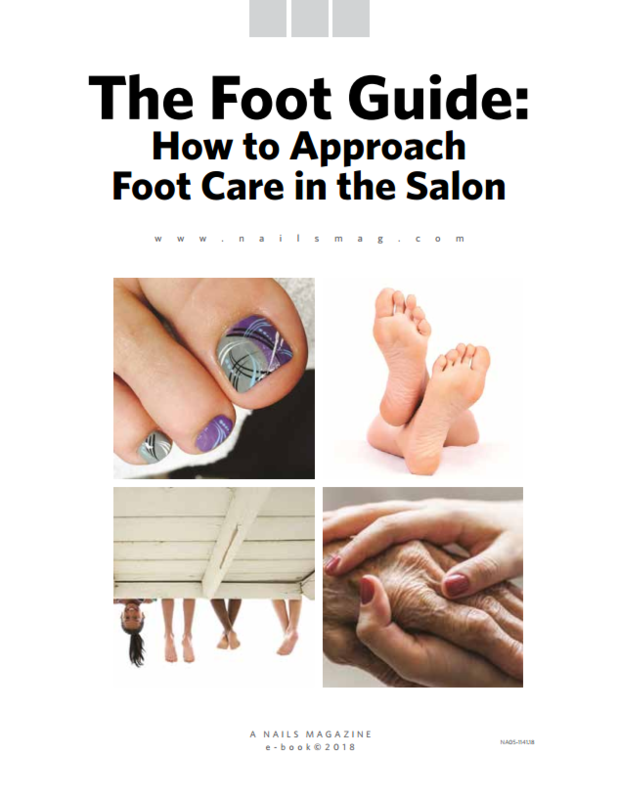 Along with heel-focused care in the salon, offer clients remedies for home use. This can include traditional items, such as body butters, oils, and lotions, and can extend to socks to wear overnight and files, buffers, pumice stones, etc., to keep dry skin at bay. A typical pedicure includes a “gentle exfoliation,” but this slough and scrub is more intense than that. This add-on should take about 10 additional minutes and requires the nail tech to apply sloughing lotion to the heels and follow with a buff using a coarse file or pumice stone. Sloughing lotion has a satisfying effect because it appears as though tons of dead skin is being removed from the dry area. 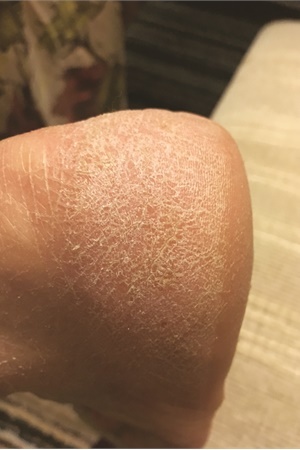 The truth is some dead skin is coming off, but some of the debris is simply the lotion itself. Either way, it’s an effective way to soften skin and remove dead cells. Some sloughing products are applied as a standard lotion; others as a foam or gel. You can even choose some with a fine grit to enhance exfoliation. Once the lotion has been completely sloughed away, use a file or pumice to finish the job. Because the active ingredients of the sloughing lotion are still present on the surface of the skin, it will be easier to remove the stubborn patches that remain. Follow with a hydrating body lotion that contains shea or cocoa butter. A clay mask will do two things: First, it will keep the hydrating, softening ingredients on the skin for up to 10 minutes. Second, many masks rely on heat, which activates the ingredients to work better. A tech can offer a peel in one of two ways: as a service in the salon or as a retail item with directions to complete the peel at home. Some peels require only a 15-20 minute soak time, which means a tech could apply them in the salon by adding that amount of time to the service. Others need a full hour for the peel to rest on the skin, motivating techs to sell it to clients to use at home. Either way works; but, if possible, leave the decision to the client. For those who want the tech to deliver, let them know they should schedule a time when they can come to the salon for an hour to soak. When they come in, set them up in a seat that doesn’t have the potential to generate money. (In other words, don’t put them in at your mani desk or in a pedicure chair if it might prevent you from seeing other clients during that time.) Wrap your client’s feet in warm towels for 10 minutes to soften the skin, then follow manufacturer’s instructions for applying the peel. Provide your client with a refreshment to relax with, and let her soak for the required time. Remove the mask and wash the feet to cleanse the peel from the skin. Schedule a pedicure for seven to 10 days following the peel to remove loose skin and buff remaining dry patches. Retail items for this client could include tea tree oil, which she would apply daily to help heal the skin, and also a file or pumice stone to stay on top of dry skin. Why it works: Ingredients in peels work to soften dead skin cells and break down the molecular bonds that hold the dry cells together so the skin will shed. Other ingredients moisturize the skin that remains. There is no need to choose a harsh chemical peel that will be too aggressive on the skin of the foot. Natural peels are available that use extracts to achieve extraordinary results. Choose an abrasive grit for the sanding band that is appropriate to the degree of dryness and cracks on your client’s skin. You may want to start with one grit and then switch to a lighter band once the heavy work is done. An electric file has immediate and impressive results. Be sure to explain to your client what she can expect when the file spins across the skin. Finish by buffing the skin and follow with a soak and the remainder of the pedicure. Why it works: Sometimes, dry, dead skin needs to be removed, not just softened. A micro blade may be effective in the hands of an experienced tech, but it can cause cuts and abrasions on skin that is already damaged; plus, many states prohibit their use. An electric file allows techs to remove rough, stubborn areas without all the muscle required for a rasp. It’s a safe, effective option to remove the dead cells using various degrees of abrasion. Clients often opt for paraffin for the heat. Its healing properties works wonders for reducing pain in joints and sore muscles. Paraffin is also highly effective at healing dry skin. “It’s my number-one choice for helping my clients with dry heels,” says Dr. Klemeyer. Professional-grade paraffin wax may contain essential oils that provide additional support to restore skin, such as eucalyptus, rosemary, and peppermint. For this reason, perform the entire pedicure first, ending with the paraffin soak. Remove residual oil from the toenails before applying polish. Why it works: Paraffin is a by-product of petroleum, and for that reason some people shy away from its use. However, paraffin effectively provides relief from rough heels because the moisturizing properties of the emollient remain on the surface of the skin even after the wax is removed.